Some time ago I shared some excerpts in English translation from the Syriac version of the Martyrdom of Christopher. One of my favorite aspects of hagiographic study is the fact that so many texts are available in some form or other in more than one language (an aspect investigated by Paul Peeters and others): translators active in the languages of the Christian east spared little effort in effectively broadcasting these versions across the lands of the eastern Mediterranean, in Africa as far as Nubia and Ethiopia, at least, and along the Silk Road further east (in Syriac, Sogdian, and other languages). An incomplete picture of this translation activity can be seen in the outdated but still essential Bibliotheca hagiographica orientalis (1910), incomplete because of its age, because it reflects only published (as opposed to manuscript) resources, and because not all languages were included, the almost complete absence of Georgian being especially noteworthy. (See the bibliography I am compiling here.) These translated texts offer readers a lot to compare, whether in terms of content — how are the versions different or the same, for example, and why? — or in terms of specific linguistic categories, i.e. within the study of translation technique. Editions and studies of hagiographic text materials often take place along the lines of a single language (whether the original or a translation), less frequently with texts in two languages, but a great many hagiographic texts offer the possibility and promise of multilingual synoptic editions. That said, nothing so grand here and now: without going into detail about the possible textual relationships of the versions of this story, here is only a short look at an Armenian and Georgian version of the martyrdom-tale, with a bit on Old English at the end. What follows is a single paragraph from the beginning about the saint’s appearance, origins, and first impulse towards martyrdom; the text is from Kekelidze’s edition of the Christopher tale (§ 2) from manuscript Tbilisi A-95, which is thankfully available electronically at TITUS here, along with bitonal, and unfortunately quite small, images of the manuscript itself. Even a quick comparison with the published Greek text (ed. G. van Hooff in the very first issue of AB , this part on pp. 122-123) shows that an exact alignment of the two is impossible, and so, too, with the Armenian (here in Վարք եւ վկայաբանւթիւնք, vol. 2; “dog-headed” in Armenian is շանագլուխ, in case you’re wondering). Here are the beginnings of the aforementioned Armenian and Georgian texts with English translation and, for students of those languages, some lexical and grammatical notes. For comparison, note these synaxarion-readings: Arm. in PO 21: 429-433; Arab. in PO 16: 278-280; Gǝʿǝz in PO 46: 490-493. There was a dog-headed man, whom a count, after having found him in battle, brought him to the king and enlisted him in his army, the name of which was Margarit [Greek ἐν τῷ νουμέρῳ τῶν μαρμαριτῶν]. Having seen the works of wickedness [there], [the dog-headed man] was troubled, and his heart having been moved by the grace of the Holy Spirit, he would ask God to be favorable and assisting in everything, that he might be permitted to speak the word of life with the same language and speech, and he was not skilled in speech. იყო ვინმე კაცი მდაბალი და მოშიში ღმრთისაჲ. უცხოთესლთა ნათესავი, და ძაღლის-თავი იყო იგი. რამეთუ იყო იგი სოფლისაგან კაცის-მჭამელთაჲსა ტყუედ მოყვანებული გუნდისა ერთისაგან; და იქცეოდა იგი წინაშე მეფისა, და ნაქმევსა პირისა მისისასა შესცხრებიან. ხოლო ხედვიდა იგი დაჭრასა მას ქრისტიანეთასა და დევნასა ეკლესიათასა. და რამეთუ არა იცოდა მან ჩუენებრი სიტყუაჲ, ამისთჳს ფრიად და მწრაფლ მას-ცა ეგულებოდა მარტჳლობაჲ და ღუაწლი ქრისტჱსათჳს. There was a certain man, humble and God-fearing, of barbarian stock, and he was dog-headed, since he was from the region of cannibals, brought as a prisoner from a troop. He would spend time before the king, and they enjoyed looking on the appearance of his face. But he noticed with concern the injury being done to the Christians and the persecution of the churches. Since he did not know speech like ours, for this reason he was greatly and quickly desiring martyrdom and a struggle for Christ. 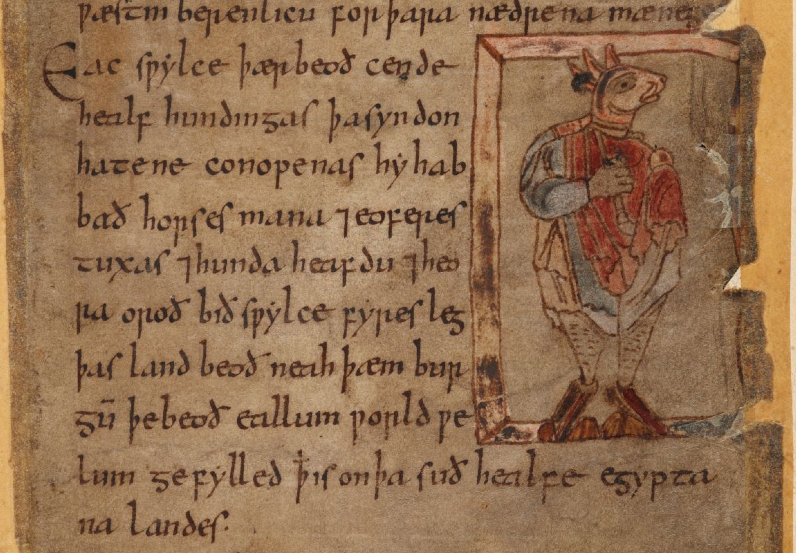 Finally, and for fun, here is mention of dog-headed people, this time in Egypt, in The Wonders of the East in the famous Old English manuscript, Cotton MS Vitellius A XV, f. 100r (see here), presented essentially as in the manuscript, with a few vocabulary items. …of þære þeode þær men habbað hunda heofod ond of þære eorðan on þære æton men hi selfe. he hæfde hundes heofod, ond his loccas wæron ofer gemet side, ond his eagan scinon swa leohte swa morgensteorra, ond his teð wæron swa scearpe swa eofores tuxas. he wæs gode geleaffull on his heortan, ac he ne mihte sprecan swa mon. …from the nation where men have the head of a dog and from the country where men devour each other. He had the head of a dog, his locks were exceedingly thick, his eyes shone as brightly as the morning star, and his teeth were as sharp as a boar’s tusk. In his heart he believed in God, but he could not speak like a man. Thanks for this always interesting blog. бѣ же моужь сь родъмь ѿ ѱии главъ и ѿ землѧ чл҃вкоядьць . бѣ же вѣрьнъ съмыслъмь пооучая сѧ словесьмъ бж҃иемъ . въ съвѣсти своѥи . не можаше бо гл҃ати нашею съвѣстию и бесѣдою . видѧ же блаженыи бывающȢю бѣдȢ крьстияномъ печаловаше сѧ зѣло . This man was from the Dog-Heads, from the land of the Man-Eaters. He was faithful in his spirit, learning/training himself in the words of God in his thought, for he was not able to speak in our thought and language. and [when] the blessed one saw the distress being [inflicted] on Christians, he was in deep sorrow. Thanks a lot for sharing this parallel Slavonic text!